In a medium sized mixing bowl whisk oil with soy sauce, vinegar, honey and Sriracha. Stir in chili pepper flakes, garlic and ginger. Rinse off wings and place in a large ziplock bag. Pour marinade over wings and close making sure to release excess air. Give the wings a good shake making sure they are covered in marinade. Let marinade over night or up to 24 hours. Preheat grill on low for 5-10 mins. 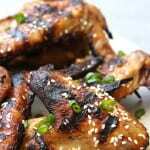 Grill large wings for 8-10 mins per side with the lid closed and small wings for 6-8 mins per side. Once grilled on both sides kick the heat up to high for 4 mins for slightly charred areas. If skipping the last 4 mins, additional time may be needed on low heat. *Please use as many organic ingredients as possible. * Total prep time does not include marinading time.